Brazil is coming from a three-year recessionary period, with an unemployment rate still above 12%. 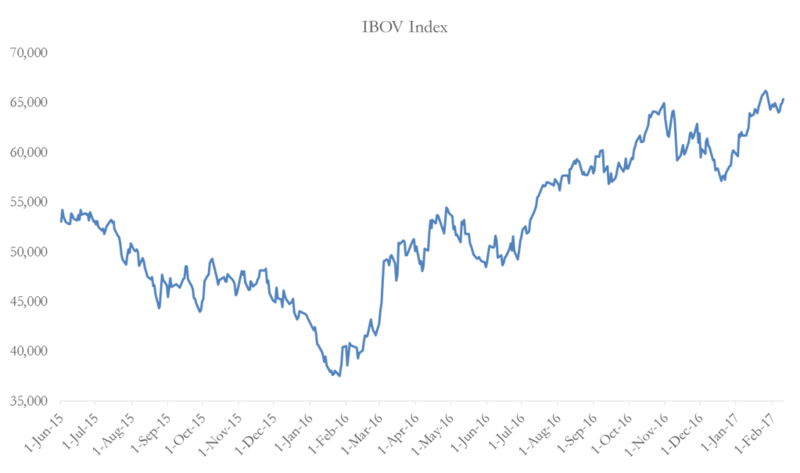 Despite this, the Bovespa index (IBOV), which is the top equity index for the Sao Paulo Stock Exchange and has 59 components, is up almost 10% since January 1st 2017 and up 70% since January 2016 (Chart 1). The current peak has produced a widespread deterioration of the trading multiples of the listed companies. In this article, we will give an overview of the main macro drivers of this trend and we will assess the sustainability of this movement. Finally, we will suggest a possible trading strategy to exploit the current environment. 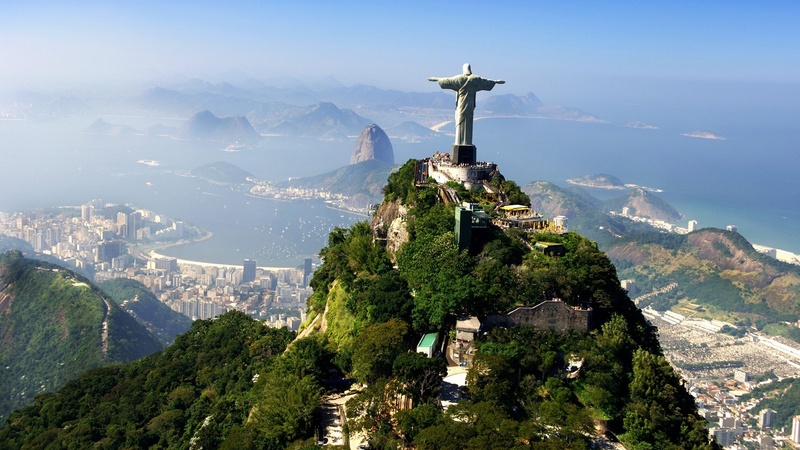 Brazil is emerging from a period of political turmoil, which saw the suspension of President Dilma Rousseff on May 12th 2016 for impeachment trial. As a result, Michel Temer took office on August 31st 2016. Markets looked with favour at the nomination of President Temer given expectations on more business-friendly policies. This has quickly pushed up Brazilian equities in the past 12 months. Despite the harsh austerity measures put in place by the government, the deficit stood at 8.9% of GDP in 2016 and the primary deficit is forecasted to hit 2.5% of GDP in 2017, missing the target of 2.2%. The government’s budget has been strained over the last few years by the rising unemployment, which is weighting putting downward pressure on real wages and personal consumption. 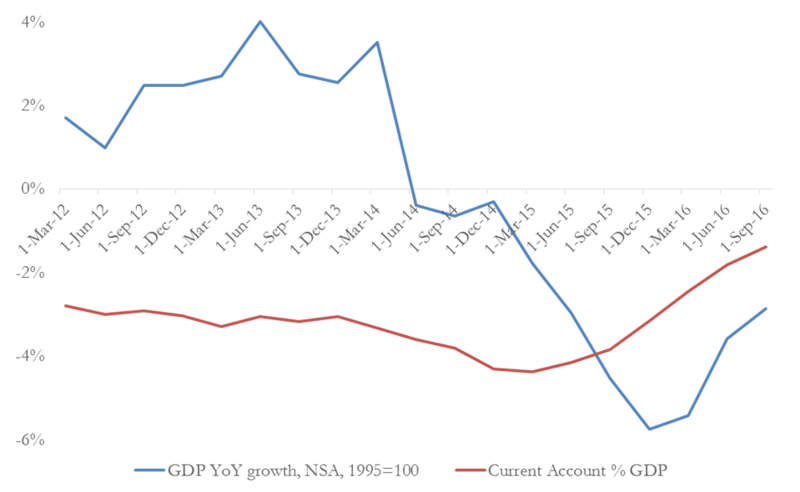 Finally, there has been only a timid deceleration in the recessionary pattern of the GDP YoY growth and the Current Account (CA) remains negative, as you can appreciate looking at Chart 2. Yet, further austerity policies might be eased thanks to the fact that the elasticity of tax revenues with respect to GDP growth has declined to 2.0 from 3.1 over the last decade, thus making the fiscal budget more resilient to unexpected reversals of the GDP growth path. The recession has also been stretched by the monetary tightening that followed the end of the US QE and the start of the FED tapering process. The Banco Central do Brasil (BCB) hiked the benchmark interest rate from 7.25% in 2013 to 14.25% in mid-2015. This move was implemented as a response to the depreciation of the Brazilian real (BRL) with respect to the US dollar (USD) during the same period and to the jump of inflation from 5% in 2013 to more than 10% at the beginning of 2016. This contributed to ignite what we can call a “balance-sheet” recession, in which companies found themselves deeply over-levered and were forced to scale back production and restructure their balance sheets. Over the last few months, this protracted tightening contributed to a complete turnaround of the BRLUSD exchange rate, with the BRL rallying against the USD. 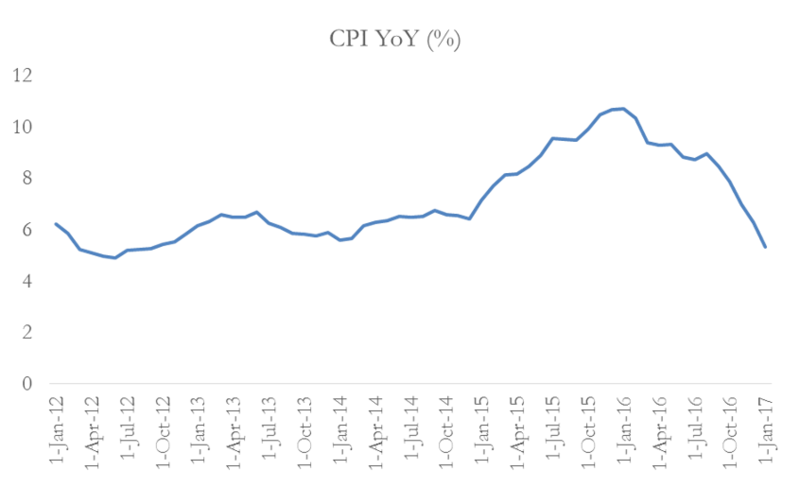 Furthermore, we have also seen a closely related and sudden fall of the CPI to 5.35% YoY from a height of 10.71% YoY in January 2016. This rapid change of trend has pushed real interest rates above 6%, something which is increasingly attracting foreign capitals in the bond market, in spite of the still high idiosyncratic risks. This led to a changed economic landscape: negative GDP growth, negative CA, appreciating Brazilian real and falling CPI. The new environment, coupled with the still high unemployment rate, has driven the BCB to start easing its monetary policy in October 2016 in order revive growth by encouraging investments and giving some relief to levered companies. The BCB is expected to maintain this easing path with around 350bps of policy rate cuts over the rest of 2017. Historically, monetary easing has consistently pushed up equities market in Brazil and the change in the expectations about the future policies of the BCB has been one of the main drivers of the current rally of the Bovespa index. It is yet to be seen if the expected easing cycle will sustain the improvement of the broader economic outlook. A positive factor for the economy of Brazil is that it is more domestically oriented than many other emerging economies. To give a reference point, the ratio of the Brazilian exports with respect to GDP is equal to 13%, not comparable with 22.1% of China, 29.5% of Russia, 30.7% of South Africa, 19.9% of India (source of data: World Bank). This implies a lower elasticity of GDP with respect to an appreciation of the Brazilian Real ceteris paribus. This has made Brazil the best target of investors in the emerging markets that need to hedge against geopolitical risk and against the uncertainty around the new Trump administration’s trade policies, thus further strengthening the Bovespa rally. On the other hand, the BCB will still have to adjust its next moves by taking into account what the hiking path followed by the Fed will be. In fact, in case of faster-than-expected hikes by the FED, the BCB might respond by not easing furtherly, in order to arrest a possible excessive depreciation of the real. 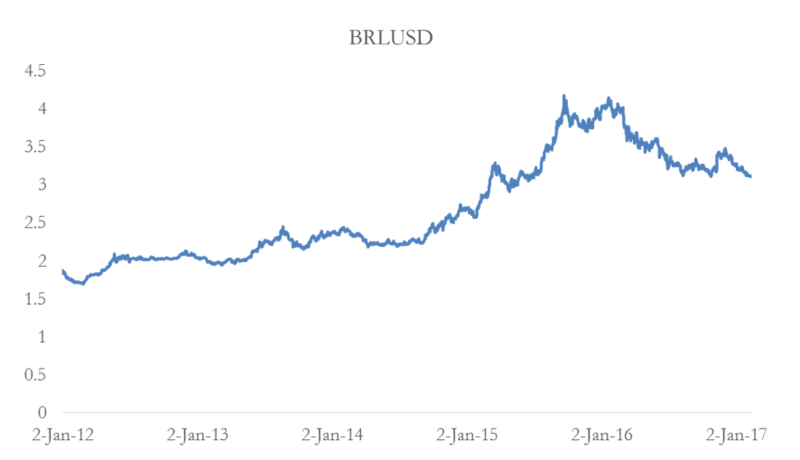 BRL per USD, so that an increase of BRLUSD implies a depreciation of the BRL. This point will be later detailed. Within the target band set by the BCB, i.e. 4.5% +/- 2%.